Since we moved house in September I have been badgering Matt to buy Florence a single bed or ‘a big girl bed’ as she calls it. She’s been sleeping in her toddler sized bed since she was 15 months old (a mistake we won’t be repeating this time around-it was far too early) and she is starting to out grow it. We bought a single sized duvet for her a few weeks ago as her smaller one kept slipping off and waking her in the night but now her room always looks messy as the duvet cover doesn’t quite fit and swamps the bed. With the baby’s arrival in 2016 I think now would be the perfect time to get Florence set-up and settled in her new bed. I’ve been keeping my eyes peeled for a bed for quite some time now and have come to the conclusion that any bed we choose needs to make the most of the space we have. It also needs to be white, to match her existing furniture and it needs to be good value for money. I came across a midsleeper bed in a high street store which I loved but it was around £750 and a little more then we wanted to spend so I went back to the drawing board, or the internet in this case and came across Room to Grow*. Room to Grow is an online children’s furniture and accessories store and seemed to answer all my prayers! I browsed through their website and came across the range of mid-sleeper beds with prices as low as £230! I feel in love with the Stompa Play Pink Stars Midsleeper. 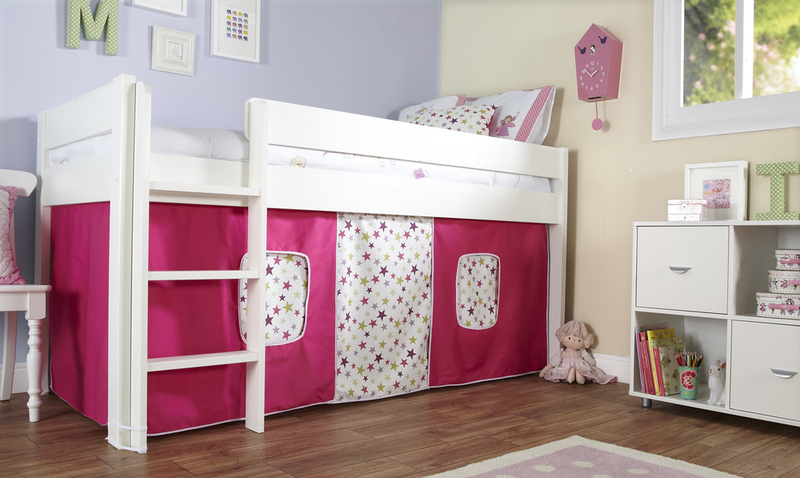 The bedframe is solid pine and comes with a three sided pink stars tent. Florence’s favourite past time right now is hiding so I think this bed would be right up her street. When she isn’t hiding we can store her toys under there or she can use it as a ‘secret den’. I can imagine, when her little sister comes along, they would get up to all sorts in that little space. I’d have cut my arm off for a bed like this when I was little! What I really like about the website is the price match offer and the fact you can add the mattress and all the little extras there and then or you can shop elsewhere. It’s a very flexible and easy way to shop. I think I need to wave this under Matts nose a little more and as soon as Christmas is out the way we can get Florence her very first big girl bed. Next Post High risk pregnancy?